Do your shoelaces ever come untied when you didn't want them to? Do you ever resort to a "double knot" to keep your shoelaces from coming untied? If you answered yes to either question, then you are in need of the shoe-fu on this page. These advanced shoe-tying skills will solve the above, and also help you pick up MOTAS in bars, get you a raise, end world hunger, and enable you to prove that P = NP. Shoe poo. Quality. Works. The magnum opus of footwear attachment. Lesson One regards the granny and square knots. Knot people call the standard shoelace knot a "slipped square knot", "slipped" because the second half of the knot is tied with loops that enable you to enjoy easy untying by pulling the loose ends. Most people don't pay much attention to how they tie their shoes (after all, they've been doing it since the first grade! ), and if they're unlucky they end up with a slipped granny knot some or all of the time. Grannies are good, but granny knots are bad -- they hold poorly and will come undone unexpectedly. You might trip over your laces and squash the tater tots in your pocket. Your first assignment: untie your shoes. 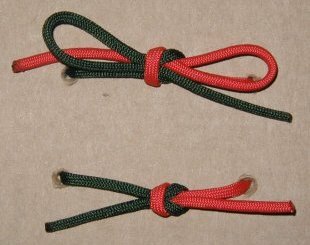 Re-tie them without using loops (i.e. 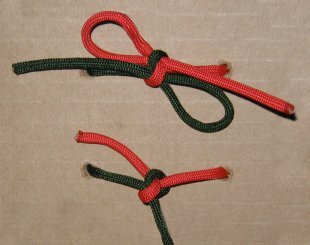 using unslipped knots). Compare your work to the photos above. Did you tie a granny or a square? Now, untie and re-tie using the other knot, even if you got a square. Repeat this a few times until you can reliably tie and identify both a granny and a square knot -- if you're having trouble, try Grog's animated square knot. The next step is do the same, but with slipped knots. Once you've mastered the slipped granny and square knots, just pay attention and always use a slipped square knot to tie your shoes. You are now a Shoelace Ace. Even the slipped square knot is insufficient to hold some laces. You could double-tie your laces, but this is hard to untie, especially if you've been wading through chest-deep mud. 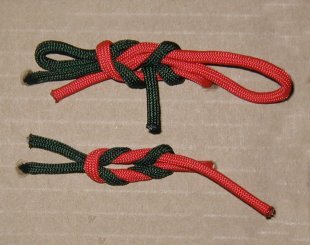 A better solution is a modified surgeon's knot: this is the same as a square knot, but with an extra twist on the top and bottom (see above). I find this to hold as well as a double square knot, and you can still pull the loose ends for instant satisfaction. This completes the lessons. You are now a Shoe Shiek. Go treat yourself to some shish kebabs and sherbert! Copyright © 1999-2013 Reid Priedhorsky. Last modified: 2005-10-11 22:01 CDT. Disclaimer.